If you’re just dipping your toes into sharing your art on a Facebook business page, no one will blame you for feeling perplexed over some of the terminology being thrown around. Buckle up, because the term “organic” isn’t just for overpriced fruit anymore. “Organic” is a term that in this case means unpaid. Anything you post on Facebook without paying is an organic post. Work-in-progress photos, random thoughts, sharing posts by other accounts, and links to blog posts are all organic posts as long as you don’t pay to boost them (more on “boosting” later). Organic posts will generally reach far fewer eyes than a paid post, unless it happens to go viral. Use organic posts for everyday interaction with your followers. Ask questions, share photos of your works in progress, share what you ate for lunch! If you are ready to announce a new series of work that just went live in your shop, make a super important announcement that you need as many followers as possible to see, or promoting a sale, you may want to consider laying down some cash instead. 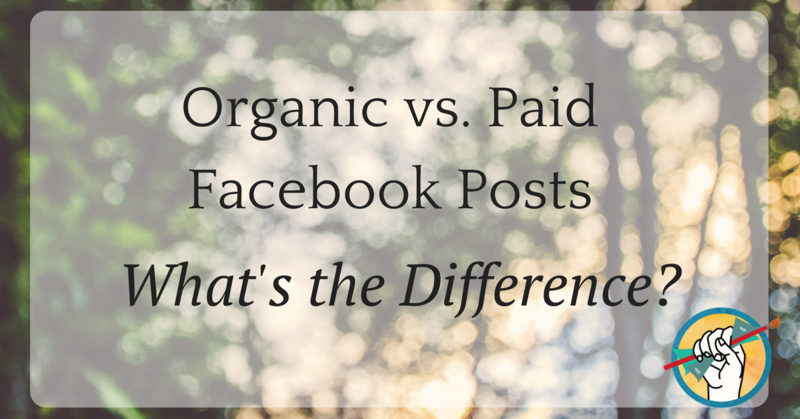 There are two types of paid Facebook posts: paid ads, and boosted posts. Paid ads are advertisements that you create in Facebook Ads Manager with the express intent of showing up in someone’s feed who wouldn’t otherwise probably see your post, to advertise something important to them. “Boosting” a post, on the other hand, is paying money for Facebook to show what was originally an organic post to more of your own followers that weren’t seeing the original post. You may want to boost posts to your own collectors once you have an established following. Here’s how to get your first collectors on Facebook. If it’s something you’d pay money to have advertised in a more conventional sense (for example, if 5-10 years ago you might have paid to show it as an advertisement on a high-traffic website), you should pay money to advertise it on Facebook. The most successful ads will be targeted to a specific group of people with a specific action they can take. Don’t boost posts willy-nilly just because Facebook tells you that you should (and it will). Paid Facebook posts should be strategic and planned in advance. Make sure you’re focused on selling strategies that are specific to Facebook. Need more help with Facebook? Check out Facebook Marketing for Artists. If you’re not sure whether Facebook is the right choice, here’s a tutorial on how to choose the right social media platform for your art business.